Make your tax return preparation reservation now! Dawn Siemer on temporary leave. Identity theft creates a race to file income tax returns. Mortgage brokers aren't in a real estate business. Tax Court finds payments to egg donor were taxable income. President's tax proposals probably going nowhere. Failure of tax return preparer to efile is not reasonable cause for late filing. Postponed taxable income from business debt cancellation taxable in 2014. New form issued for annuities extending. Visit our new articles: Predictable Revenue book review. 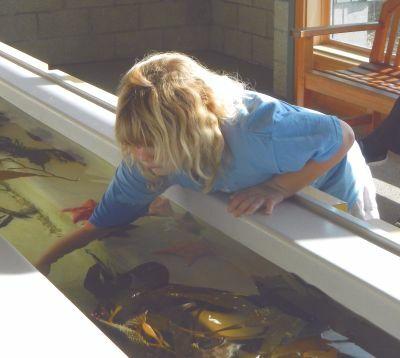 Kara Siemer explores the touch tank at Seymour Marine Discovery Center. Valentine's Day, February 14, will fall on a Saturday this year. Have you made your reservations for dinner yet? Dan and Holly Baker tell me MarchÃ© Aux Fleurs restaurant in Ross is already fully booked. Get your gift shopping done soon. Let your loved ones know you appreciate them! Clive Baker, who is my grandson, will celebrate his seventh birthday this month. Happy Birthday Clive! It's tax season! Notice how fast January flew by? Before we know it, it will be April 15! Most of our clients send their documents and use an online organizer that we have available. A few like to have a meeting to bring their information. Most of our tax return preparation meetings are scheduled in February, and there are only a few slots left. To make your appointment for a meeting now, call 408-918-3162. Dawn Siemer will be recovering from surgery on her hand during the first two weeks of February. Please be patient with her temporary replacement. The IRS processes the efile of the first tax return that it receives for a social security number. We had two clients who had to file paper income tax returns and submit documents to the IRS because someone else filed income tax returns with their social security numbers before we submitted their efilings. It's a mess to straighten this situation out. This is another good reason to file your income tax returns as early as possible and avoid extending the time to file your income tax returns. IRS Chief Counsel says mortgage brokers aren't in a real estate business. According to the IRS Chief Counsel, a mortgage broker may be considered a real property brokerage business under state law, but it isn't a real estate business for testing whether an individual qualifies as a real estate professional under federal law. It's a financing business. This is an important ruling under the passive activity loss rules, and some mortgage brokers who believed they qualified as real estate professionals may be unpleasantly surprised. A side effect is mortgage brokers who don't qualify as real estate professionals may find they are subject to the 3.8% net investment income tax on their investment income, including from rental real estate. A taxpayer agreed to donate some of her eggs and received payments for "time, effort, inconvenience, pain and suffering" in donating her eggs. She did experience bruising and headaches relating to the procedure. She claimed the payments should be excluded from taxable income because they related to a physical injury. The Tax Court upheld the IRS in holding the payments were taxable income. The payments were for the service of donating the eggs. She voluntarily agreed to the procedure, and her "side effects" were to be expected in the circumstances. There was no tort or threat of a lawsuit for physical injury. President Obama made some tax proposals in his State of the Union address, last week. A major revenue raising proposal was to raise the maximum federal income tax rate for long-term capital gains to 28% for certain high-income taxpayers. With a Republican majority in both houses of Congress, it's highly unlikely that any of his proposals will be adopted. Failure of tax return preparer to efile is not "reasonable cause" for late filing. The California State Board of Equalization ruled that two corporate taxpayers were subject to late filing penalties when they gave authorizations to their tax return preparer to efile their income tax returns, but the Franchise Tax Board had no record of receiving the returns. The Franchise Tax Board sent late notices to the taxpayers, who submitted the returns immediately. The taxpayer is responsible to assure its tax return is submitted on time. It's a good idea to get a confirmation from the tax return preparer that the tax authorities have accepted efiled income tax return. Postponed taxable income from business debt cancellation starts being taxable in 2014. As business income tax returns are prepared for 2014, some taxpayers and their tax return preparers need to remember that it's time to start "paying the piper" for certain business debt cancellation income. As a tax relief measure for taxpayers who were suffering during the Great Recession during 2009 and 2010, Congress enacted Internal Revenue Code Section 108(i), which provided an election to postpone taxation of business debt cancellation and enabled taxpayers to spread the taxation ratably over a five-year period. For both years, the income starts being taxable for 2014. New form issued for annuities extending IRA payments. A new type of annuity, called a Qualifying Longevity Annuity Contract (QLAC), enables certain taxpayers to postpone part of the IRA distributions that would otherwise be required for IRA owners over age 70 Â½. The amount transferred to the QLAC is excluded from the base that is used to report the required minimum distribution for IRAs. New Form 1098-Q is used to report information for the accounts to the IRA owner. It is required for QLACs starting for tax year 2014, the first year the accounts were available. February 6, 2015, Jennifer Cunneen, attorney at law, Hopkins & Carley, "Should a family trust be terminated considering recent federal tax law changes?" February 13 and 20, 2015, Jennifer Cunneen, attorney at law, Hopkins & Carley, "California real estate reassessment change of ownership rules"
February 27, 2015, Richard Schachtili, attorney at law, Hopkins & Carley, "Succession planning for a family business"
March 6, 2015, Michael Malter, attorney at law, Binder & Malter, LLP, "Personal bankruptcy"
March 13, 2015, Michael Malter, attorney at law, Binder & Malter, LLP, "Corporate bankruptcy"
March 20, 2015, Greg Carpenter, BTI Group Mergers & Acquisitiions, "Buying a business"
March 27, 2015, Greg Carpenter, BTI Group Mergers & Acquisitions, "Selling a business"